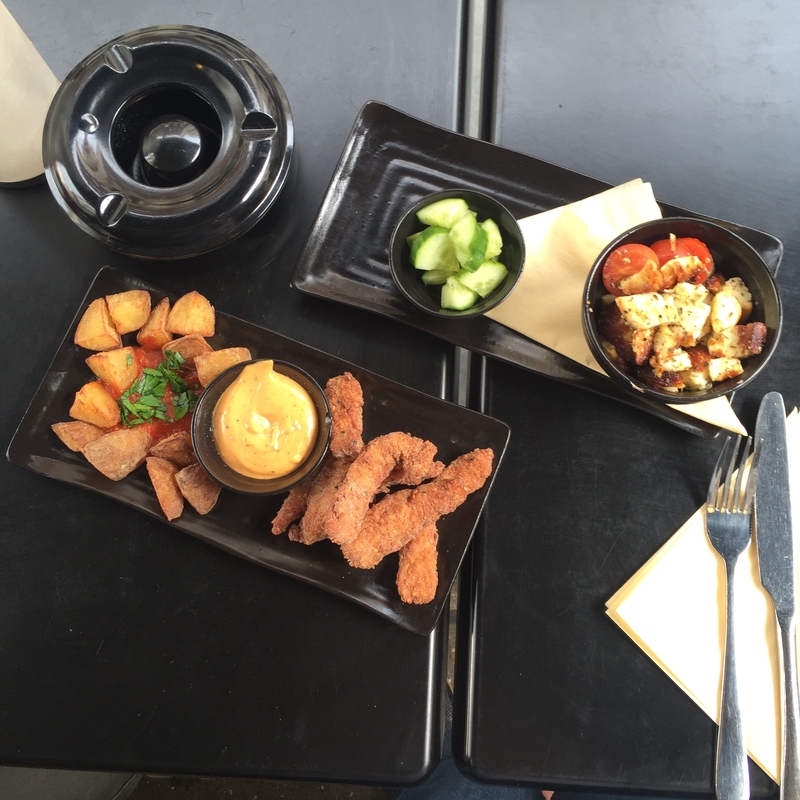 This week we were kindly invited to eat at Drunch which is just off of Oxford Street in the heart of London. Drunch as a venue fills a unique gap in the restaurant market as it offers Halal European food in a great location. By day, it has a relaxed environment where you can soak in the nice weather by dining outside (when the sun decides to shine on London). By night, you can enjoy the same great food with your friends and family, but you can sit in the basement room and play Playstation or enjoy Shisha outside. We had wanted to try Drunch’s delicious menu for quite some time and luckily the sun was out so we could enjoy their food outdoors. It wasn’t just their food that appealed to us, though, their Instagram account makes their drinks look amazing. This juice was a mix of apple, pear and elderflower. The three worked really well together and you should opt for this juice if you prefer a sweeter, fruitier affair. 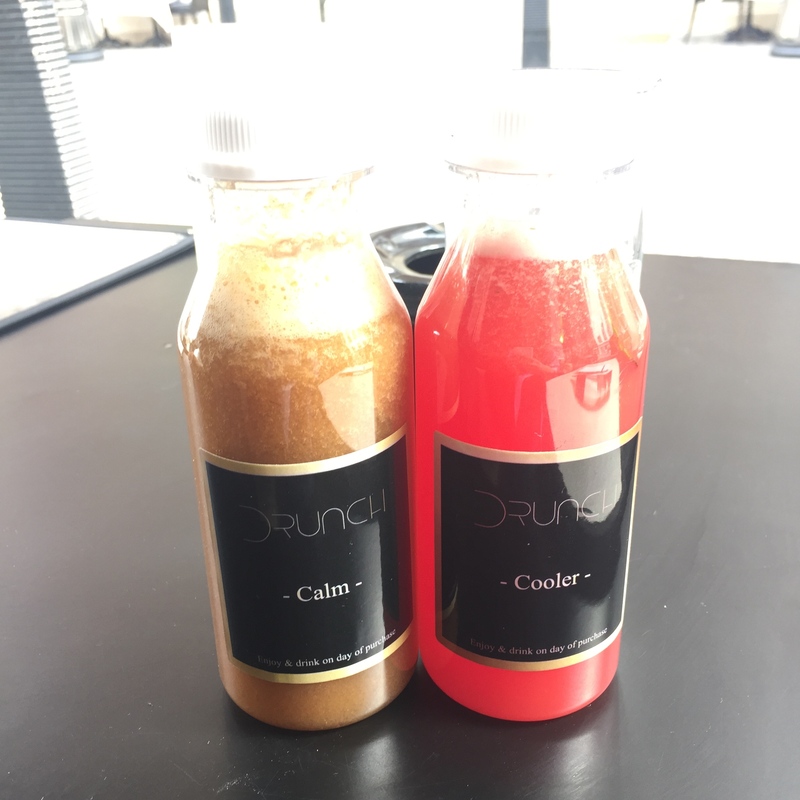 Both juices were really delicious and both A and I (Z) agree on that. I’d love to try the other juices they have on offer, but if you’re around Oxford Street I’d definitely recommend you have a taste of one of these juices. Firm, salty and rubbery cheese! That doesn’t sound very nice, but trust me it is! For those of you who have never tried halloumi before, I urge you to give it a shot as it’s scrumptious. Its texture is similar to that of a thick feta or mozzarella, except that it is a lot saltier due to the brine preserve. Drunch serve their chunks of halloumi cheese in a small bowl with cherry tomatoes and a serving of salted cucumber. These made for a good starter to share. The chicken bites were coated in breadcrumbs, sesame seeds, and onion seeds and went well with the spicy mayo provided. Patatas Bravas is a classic tapas dish where lightly seasoned potato wedge-style bites are served with a spicy tomato sauce. This wasn’t something to shout about, but it’s a nice dish to share if you visit Drunch with friends. In hindsight though, I’d probably go for the Crispy Duck and Pak Choi from the appetisers. It’s really hard to find a good halal steak, in fact, it’s hard to find a halal steak in London, full stop. When I came to know Drunch offered Sirloin Steak, I didn’t need to look at the rest of the menu. It’s so difficult trying to judge something you haven’t had elsewhere many times, but in spite of that it was obvious that Drunch’s offering was of a high standard. Priced at £18, you get a good quality cut that has the right balance of fat across it. The beef, served with Hasselback potatoes, broccoli and cream of spinach, was really succulent and it was cooked exactly how I had asked it to be. My only gripe would be that on one side the cut was chargrilled a bit too much for my liking. The meat didn’t quite melt in your mouth, but it was very tender and just seeing the juices ooze out and get absorbed by the potatoes made me feel really impatient while we took pictures of the meal! When I finally did get the chance to dig in, I wasn’t left disappointed and I definitely recommend you to try this dish. With numerous halal burger restaurants opening up, I’ve eaten sooo many that I can sometimes feel a bit burger-ed out. As a result, I wasn’t sure if I should have ordered the burger or opt for something else on Drunch’s vast menu. I was tempted to have one of their delicious sounding salads, but then… you know… that didn’t quite work out. It didn’t take long for my love for burgers to take over and I caved in to trying Drunch’s famous cheeseburger… and boy am I glad that I did! I ordered the burger cooked medium-well done, which can often be hard to perfect; it can’t be too squidgy and it can’t be too dry. Drunch did not fail to deliver as this was a juicy and flavoursome burger that did not fall apart. I felt that the bun could have been more soft and buttery (like my all time favourite burger bun at Stax). 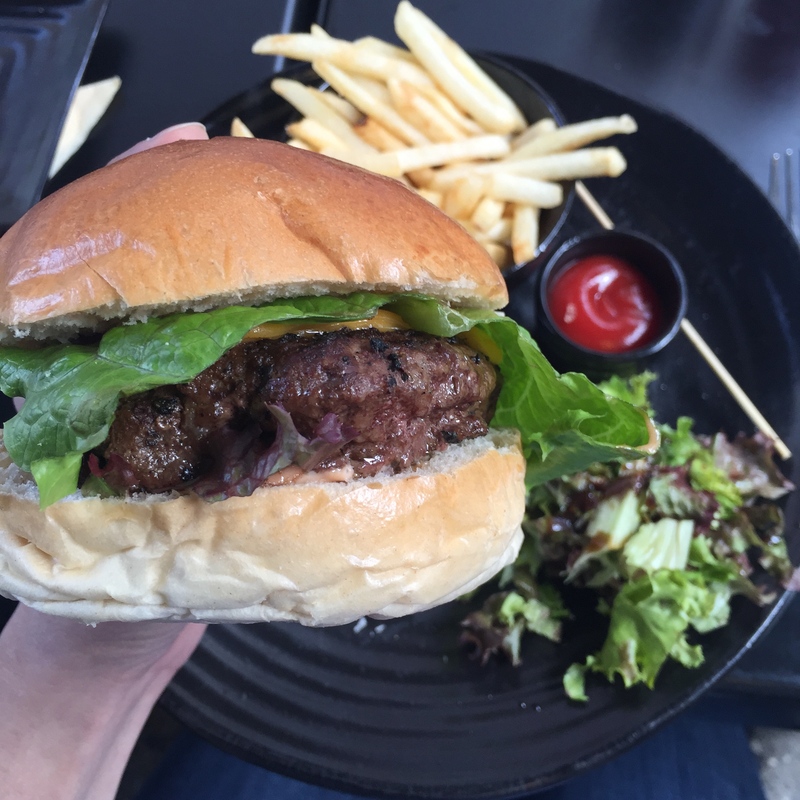 The burger was not loosely packed (where all the juices at free to ooze out) like those at other burger restaurant such as Stax and Brioche Burger, however it was not dry at all and was delicious. 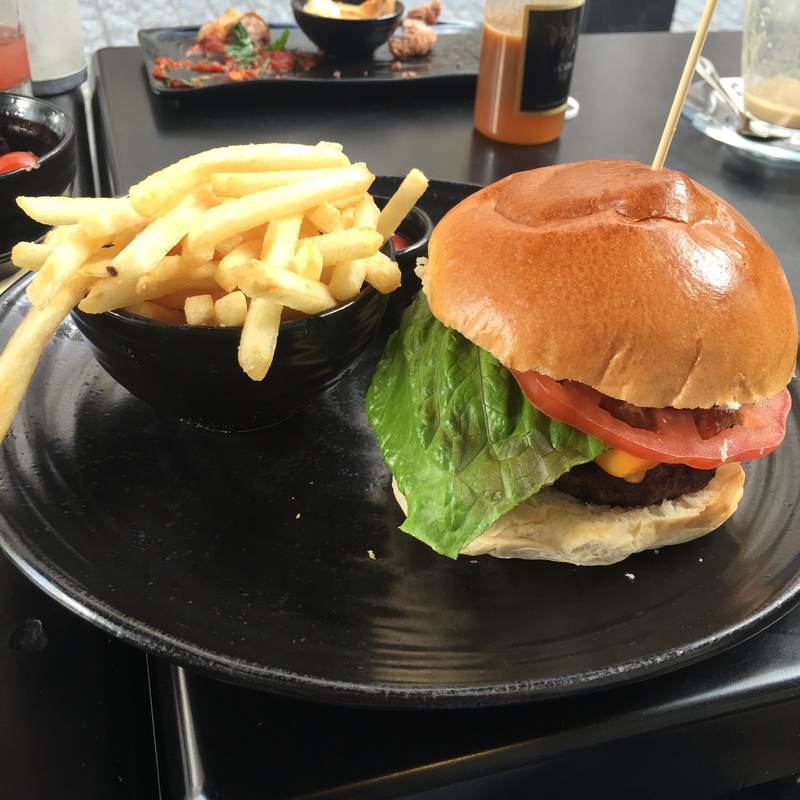 This was not the best burger I’ve ever had, but the fact that Drunch do not specialise only in burgers, made their take on it pretty impressive! They also offer an extra spicy version of the burger which would be great if you want an extra kick! I think everyone can relate to that feeling when you’re so full but you can’t leave without having dessert. Somewhere… deep down inside, there’s a tiny space that’s empty and ready to be filled with a delicious treat. For us, that was a yummy slice of Drunch’s Oreo cheesecake! 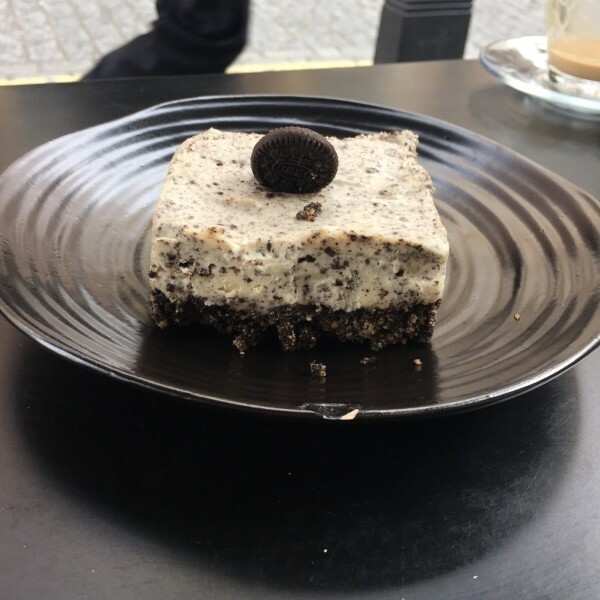 £12 for a slice of cake is extortionate, so I expected it to be amazing – and it was! This was one of our favourite biscuits made into a smooth, sweet, creamy and moreish piece of goodness. Despite the base being slightly more crumbly than I like, somehow there was suddenly more room to devour this utterly incredible cheesecake! In the end there was a tiny bit left, but we could feel our jeans getting tighter and decided to take it away to eat later. So … the plan was to go for a walk to digest our food and eat it in Hyde Park. But guess what? Z slyly stole the cake and didn’t give any to me (A). I think that means Z ought to buy a fat slice of cake all for me. Overall we had a great time at Drunch and would highly recommend it! The food amounted to about £80 with service charge, and although that is a lot for two people we ordered more than we needed. Despite being invited by Drunch themselves, and the meal being on the house, we would like to say that this review was completely honest. Next time, we’d love to come in the evening as we can imagine the atmosphere being lovely. May that be for Drunch’s great food, or just for a juice or one of their floral teas! Wow, amazing blog. Been looking for a while for a steak so DRUNCH has quickly topped my list. Thanks My Big Fat Halal – looking forward to your next blog !!! Thank you! 😀 glad you’re enjoying the reviews! My Big Fat Halal – I went to Drunch this afternoon. The burger was as scrumptious as your photos. Keep up it. Thanks.